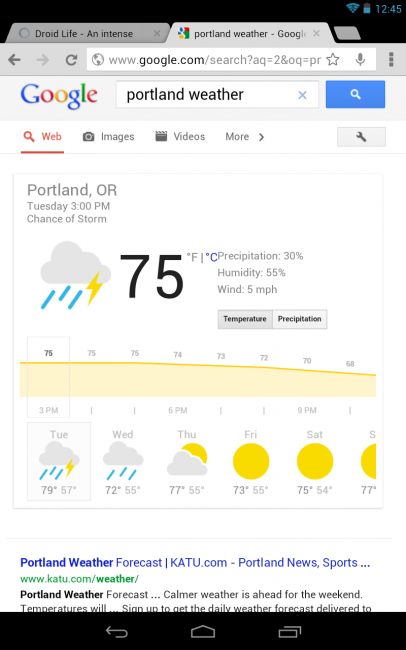 Weather searches from your tablet are now more beautiful than ever. The Google Search team introduced weather visualizations to bigger screened devices today, which as you can see, look a heck of a lot like the cards that are found in Google Now. These new visualizations are interactive, meaning you can slide the hourly temperature meter for up to 10 days, scroll day-by-day to check the forecast, and toggle between temperature, precipitation, and wind (not showing on my screenie for some reason). To get the weather to be displayed this way, simply open a browser and type “weather” in the address bar.